The mythological gaming experiences based on a novel by Slovenian author Vladimir Bartol have gone down in history as some of Ubisoft’s greatest creations. Since 2007, Assassin’s Creed and its seven sequels have been regaling us with the tales of two rivaling secret societies and their enigmatic connection to a race of pre-humans. Now, three new toys in the fourth action-figure series based on the franchise are set to be released by McFarlane in May of next year. Five-inch versions of Eagle Vision Arno Dorian, Arno Dorian and Shay Cormac are to be anticipated. Grab them on their own or save at the checkout with our set of three, pictured below! Sony Pictures will be releasing a movie version of Assassin’s Creed in 2016. Set against the backdrop of the American Revolution in the late 18th century, Assassin’s Creed III introduces a new hero, Ratonhnhaké:ton, of Native American and English heritage. Adopting the name Connor, he becomes the new voice for justice in the ancient war between the Assassins and Templars. Our Connor action figure depicts this secret hero of the revolution in his iconic Assassin robes, as seen on the cover of Assassin’s Creed III. Figure has 27 points of articulation, and comes with an Assassin tomahawk, bow, and a quiver of arrows. 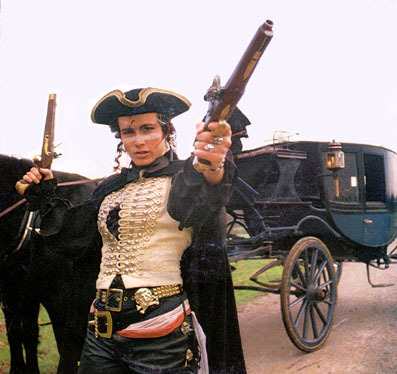 While playing the game, I noticed that Benjamin Hornigold from Assassin’s Creed reminded me of Adam Ant. What do you think? Buy the figure and see for yourself. New Series of Assassin’s Creed figures from McFarlane Toys. 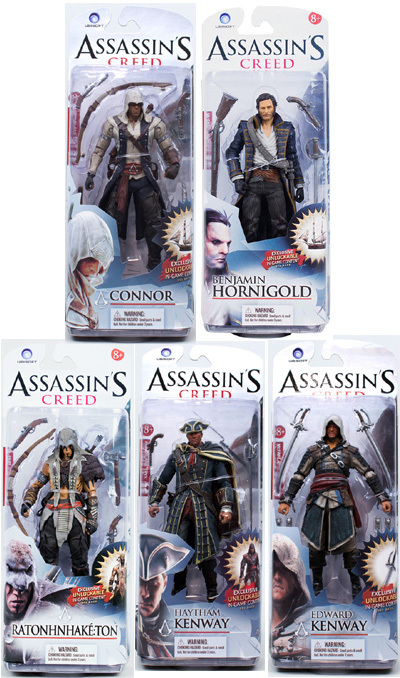 This set features: Connor, Benjamin Hornigold, Ratonhnhaketon, Haytham Kenway, and Edward Kenway. With Assassin’s Creed III on the way, we can still look back and recall the glory days of Ezio Auditore in Assassin’s Creed: Brotherhood. Standing about 8 inches tall, this ENCA rendering features incredible detail in the sculpting, but shows Ezio in his Eagle Vision form, a pale, spectral blue. He still features the awesome costume and multiple hands and comes with an eagle, ready to lead the way to viewpoints and remain a faithful, if unwitting, companion along the assassin’s journey. The statue is about 14 inches tall, depicting Ezio as he leaps from a fallen pillar to attack an unseen foe. Every detail is accurate to the game and the impressive character design of the series.